This weekend the local HMGS-South group played a Star Wars: X-Wing Miniatures game. The scenario was based on the Battle of Yavin. With the Death Star approaching, Y-wings from Gold Squadron and X-wings from Red Squadron and Green Squadron were dispatched to carry out the attack plan. A total of 30 ships were deployed in the assault on the Death Star: 8 Y-wings making up Gold Squadron and 22 X-wings, some making up Red Squadron and the rest making up Green Squadron. The Starfighters weaved through the turret emplacements destroying many as they passed. The Death Star’s defenses were designed for a direct, large-scale assault. By using small, one-man fighters, the Rebels would slip through the Death Star’s main defenses, maneuver down a narrow trench leading to the exhaust port, and insert proton torpedoes through the exhaust port. Some time into the battle, Imperial officer Jude Edivon aboard the Death Star identified the threat of the Rebels’ attack strategy, and attempted to warn her superiors of the danger. However, Grand Moff Tarkin ignored the warning and refused to evacuate the station or launch any of the stations hundreds of fighters. Meanwhile, Darth Vader himself decided to lead his personal squadron of TIE Fighters to destroy the remaining Rebel fighters. The game consisted of the main dogfight between elements of Red Squadron (7 X-wings), Gold Squadron (3 Y-wings) against Black Squadron’s 9 Tie Fighters. Meanwhile Han Solo was fighting with his conscience whether to intervene with the Millennium Falcon or continue on his way to payoff Jabba the Hut. X-wings advance and Y-wings edge right toward the center. Tie Fighters move to both flamks while Vader and his two wingmen advance in the center. Vader has lost a wingman to concentrated X-wing fire. A furball in the foreground. Vader has lost his other wingman. Another Tie Fighter is destroyed on the Imperial left wing. In the distance, the Imperial right wing swings inward to attack the Y-wings. In the end, seven Tie Fighters and one X-wing were lost. The Rebel ships continued on toward their mission to bomb the Death Star. Darth Vader survived to return in Episodes V and VI. 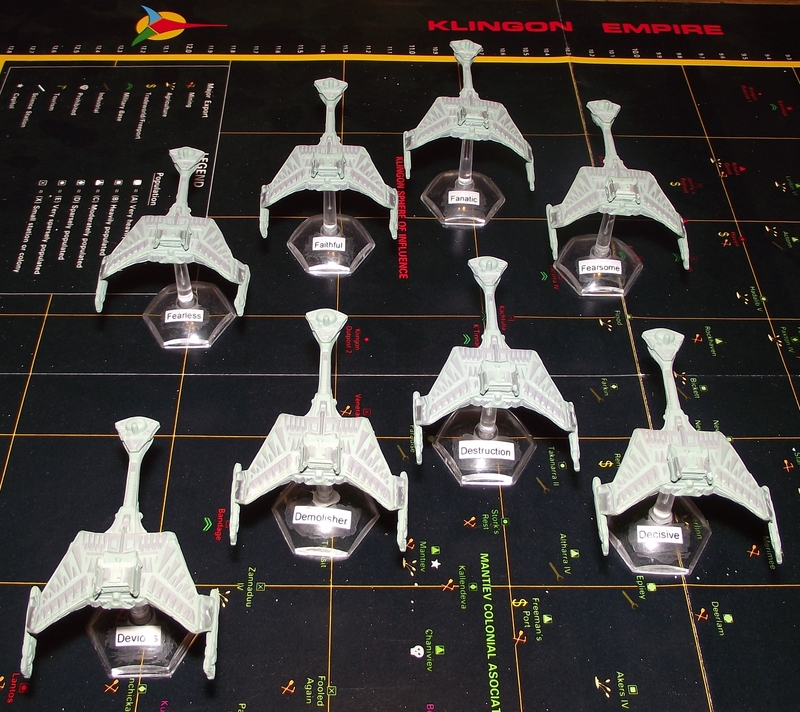 These are Amarillo Design Bureau Starline 2500 series ‘Klingon E4 Light Frigates‘ cast in metal several years ago. At 36 mm in length, they are much larger than my old escorts. They will be used for a class intermediate in size between my F5s and D7s. The E4s and F5s will thus be reversed by size, but that avoids re-labeling all the old models. Decals on new ships are from Mark’s Models and Toys. These are Star Trek HeroClix I.K.S. Amar models (from the Tactics IV set), after painting and rebasing. Compared to the normal HeroClix Klingon battlecruisers, they have extra bits sticking out from the front of the wings and from the neck, as well as other differences in detail. In most Star Trek lore the Amar is the quintessential K’t’inga class. The card that came with these models mentions the Kelvin Timeline, so that may explain the differences. Edit: A photo of an unpainted Amar is added. Amarillo Design Bureau is selling versions of their Star Trek miniatures via Shapeways. Two 1:3788 Scale Klingon C8B Dreadnoughts made with the cheapest and the most expensive available material are shown in these photos. Two early ADB models are shown for comparison. One is copyright 1979, the other is earlier, but the last date digit is not legible (c197?). White Strong & Flexible Polished on the left, Black Hi-Def Acrylate on the right. Many layers of paint and clear coat were applied to the White Strong & Flexible Polished model, and sanding was tried. The result was still not smooth, so decals were not attempted. Decals on the Black Hi-Def Acrylate are from Mark’s Models and Toys. It appears that Hi-Def Acrylate is no longer an option for Amarillo Design Bureau models. Members of the local miniatures group got together this Friday afternoon for an impromptu game of Star Fleet Battles. A Federation heavy cruiser and frigate faced a Klingon battlecruiser and two frigates. The Klingons crippled the Federation heavy cruiser, the Federation destroyed one Klingon frigate and crippled the other. Both sides disengaged, calling it a marginal Federation victory. This close range exchange guts the Klingon frigate and severely damages the Federation cruiser. This weekend the local HMGS-South group played a game of Space Hulk using the 4th Edition rules but with game parts from earlier editions. Two Marine squads supported by a Librarian and two close assault terminators were tasked with destroying two Genestealer nurseries in the hulk. The Marines advanced to the next crossroads beyond the large room where most of the early fighting occurred. The auto cannon armed Marine advanced behind the Librarians prep ‘blast’ to cover the central hall. The Librarian bravely gave his life allowing a Marine advance to within reach of the northern most nursery. Three more ambushes were popped but didn’t amount to any real threat, being screened by a single Marine each. The genestealers were gathering in the halls before the nursery for the final battle………the store was closing and the game had to be ended at that point. The photographer left early so there are no photos of the end of the game. This weekend the local HMGS-South group played a Star Fleet Battles game. An ISC cruiser and light cruiser are tasked with destroying a mining station defended by a Gorn cruiser and heavy destroyer. The map has many asteroid fields and the station is located in one. The station can only be attacked from the Gorn side of the map. Poor navigating has forced the ISC light cruiser to take a wide detour around the asteroids at the top of the photo. Gorn shuttles (white counters) deploy to defend the station. The ISC cruiser launches shuttles (yellow counters). The ISC cruiser takes internal damage and the Gorn ships aneuver away to avoid plasmas. The tardy ISC light cruiser passes by the station at high speed and unloads all weapons. The ISC plasmas are weakened going through the asteroids, but still retain enough power to destroy the station. 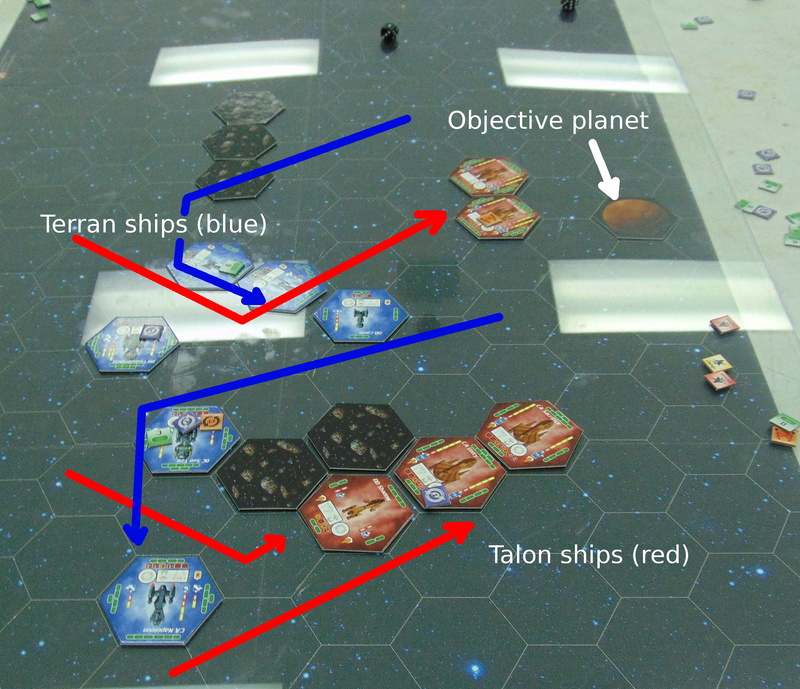 This weekend the local HMGS-South group played a Star Fleet Battles game. The scenario is set in Year 170F. The Lyrans and Klingons have just captured the Hydran Capital. The surviving Hydran forces are in a disorganized retreat to the Old Colonies but secondary Lyran forces are in position to attack the retreating forces. The Hydrans start with a Large Freighter at 0303 trying to cross the map to exit between 4201-4210. The Hydran guard force of a Traveller Light Cruiser, a Knight Destroyer and a Hunter Frigate can set up anywhere within 4 hexes of the freighter. The guard force has already seen combat and the cruiser and destroyer start with 12 random damage each. The guard force has already lost all of its fighters and has not been resupplied. The guard force only has half of its transporter bombs. A Hydran police ship Gendame has been following and reporting the location of the Lyran force and arrives as reinforcement Turn 2 near 1532 and at least 10 hexes from any Lyran ships. The Gendame does have its fighters. The Lyran force of a Light Cruiser, a War Destroyer, a Destroyer and a Frigate starts within 3 hexes of the 0132 corner. Being a secondary force it only has half of its transporter bombs. An Orion ship substituting for the Hydran police ship. The Lyran war destroyer takes damage at close range from the Hydran frigate. Lyran ships concentrate on the freighter. After two turns, the Lyrans have achieved victory by preventing the escape of the freighter.